There is no denying it, tactical vests look cool. I mean, we’ve all grown up watching movies where the action star wears one of these like a uniform. In the sense that we all want to be Jack Bauer, we want to wear tactical vests, because they look cool, so they will make us look cool, they are tacticool. But is there also a point? I was sent an Omega Elite Tactical Vest from Grabagun.com to review (and they have a good selection of others if you don’t like this particular style, so check them out). 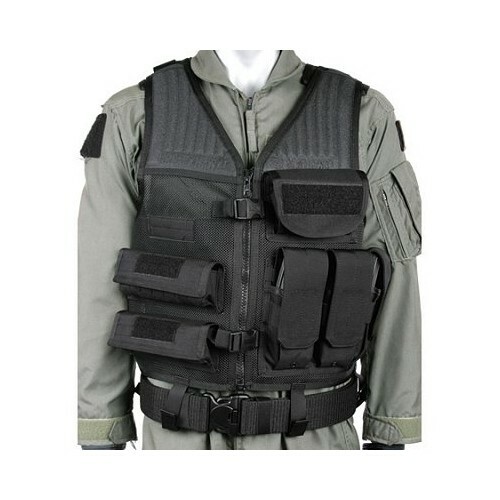 The tactical vest comes with a variety of pockets for magazines, flashlights, the one I got even has an integral handgun holster. If all the pockets were preloaded it might come in handy in an emergency situation, you can quickly slip it on and have everything you might need with you. The material is very heavy duty, but of course, it isn’t kevlar, and I’m not sure this would fit over my kevlar vest, I guess I should have asked for a size larger. However I do think it would be helpful against sharp or blunt weapons, or fists. The back is a very large pocket accessible on the inside that you could load body armor into I believe, but no such option exists for the front. The fit is good, the size 26 fits me snugly with my 42″ chest and 32 inch waist. I’m 6’5 and it rests at the top of my hip bones with belt looks available to holding it down to attach to a belt, though I do not detect it wanting to ride up at all. opinion the greatest value for it is that it can be readily adapted to look as though it is a uniform. There is a velcro location on the front right pocket for a name or other sort of identification strip. There is no location on the back though I would add a patch. Because you see, I believe the primary value in this sort of thing is reducing the chance of friendly fire. It is illegal, of course, to pretend to be a police officer, but there is nothing illegal about calling yourself security. So I would deck this out with “Security” patches on front and back. Those, combined with the vest, should give just enough pause to hopefully prevent you being shot by a good guy should you in an incident where you have to use a firearm for self defense. That, the uniform nature of the vest, is what I see as the true value in this products. Now sure, in a straight up TEOTWAWKI event, where you might be wearing this day in and day out, the value of this sort of item is obvious, but what are the odds of that happening? I think the odds of a temporary emergency, while also slim, are much more likely, and in those situations the last thing you’d want is to be mistaken for a bad guy. Functional suggestion of a uniform might be useful in those situations.